Taken on Fleshwick in the Isle of Man. One hundred and eighty-six species of the "Little Dragon" fish live from Iceland in the North to the Indo-Pacific oceans in the South. You will find Callionymus lyra shown above, from Norway in the North to Senegal in the Eastern Atlantic: North, Irish, Mediterranean, Black, Baltic and Aegean Seas. Dragonets spend most of their lives on sandy or rocky bottoms. 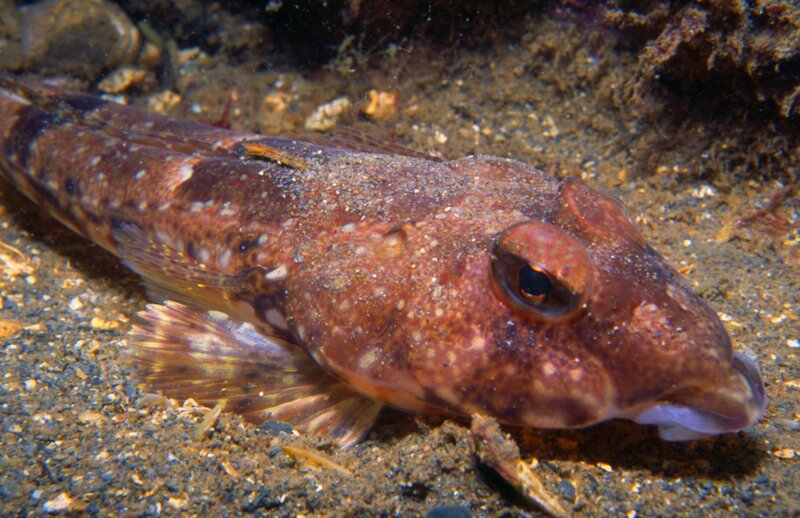 They live from the shallows down to 100 m. They are sometimes confused with gobies but have a much broader triangular, head and a long dorsal ray on their backs. If you see slender fish meeting this description darting away from you on the bottom it is probably a dragonet. The adult male C. lyra is colourfully patterned in orange and blue. The females are smaller and a mottled brown. They have an interesting courtship ritual. The male performs an elaborate display, darting around the female, spreading his brightly coloured fins and pulling faces! If the female is impressed the pair then swim side-by-side, almost vertically up to the surface. There they release the eggs and sperm into the water, spawning at dusk. Dragonet males are thought to mate only once in a lifetime.